Do you have questions about what SIM card your phone needs or where to purchase one? You're in the right place. We've also included a comprehensive Ting SIM card chart at the bottom with links to our shop page. 1. I have a compatible GSM phone. Which SIM do I need? We also offer the ability to pick up the Ting GSM X1 SIM at select retail locations as well as other online stores. We are happy to offer these locations as a viable alternative but also recommend calling ahead to ensure the Ting SIM is in stock at your local area. 2. I have a Sprint® compatible phone from a third party, and it doesn't have a SIM card. Which SIM do I need? Select the brand of your phone from the drop-down menu, and you will be directed to the correct CDMA SIM. If your phone isn't listed, then you don't need a SIM card. 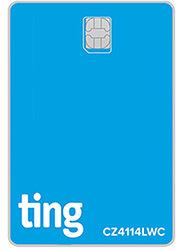 Alternatively, find your phone on our comprehensive Ting SIM card chart at the bottom. If your phone isn't listed, then you don't need a SIM card. 3. I have a Sprint®*-branded phone that I purchased from eBay, Amazon, Glyde, Newegg or another third party and it has a Sprint®*-branded SIM card already installed. Do I need a new SIM card? 4. I have a Sprint®*-branded phone that I purchased directly from Ting. Do I need to buy a SIM card? If you purchased your phone directly from Ting, your phone would automatically come with a compatible SIM, so you don't need to buy another one. 5. I've ordered a Sprint®*-branded phone from a third party but I don't have it yet so I don't know if it has a SIM card installed. Should I buy a SIM? If your phone isn't listed on our Ting SIM card chart at the bottom, then you probably won't need to purchase a SIM card for it. Only LTE capable CDMA phones would need a SIM for activation. If it is listed, you'll have to wait until you receive it to know for sure if it has a SIM card. If you don't want to wait, you can purchase a SIM card in advance or contact the seller to check if the phone will ship with a compatible sim card. 6. Can I reuse my SIM card? Most CDMA SIM cards can be reused for activation as many times as needed. Reactivate it with the same number for a brief period after it's been deactivated. Transfer or port an existing number to a GSM SIM card that's already active with another number. Reactivate a SIM card if you've ported your number away from it. 7. Can phones bought from Ting be unlocked? 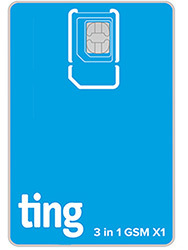 GSM phones purchased from Ting will come automatically unlocked. CDMA phones that have a removable SIM card can often be unlocked for international use. If you have a CDMA phone and are traveling, we can assist with a CDMA SIM unlock. Most multi-network phones sold from the Ting shop are factory unlocked. 8. Can Ting unlock my BYOD phone? GSM phones that you purchased through another carrier need to be unlocked by that carrier before bringing them to Ting. We provide more information on that in our Ting compatibility and unlocking Guide. Once at Ting, those phones will remain unlocked, and you'll be able to take them to any other GSM carrier that can support them. **These phones may also take the Ting X1 GSM SIM card. ***The Samsung Galaxy S5 in some situations is compatible with the CDMA SIM card B1 or B5. UICC Card SKU—This is the number that identifies this type of card in our billing system. UPC—This is a numeric value interpretation of the UICC Card SKU that is used in all front-end ordering systems. Part Number—This is the manufacturer’s part number and is generally not used by Ting.